For more details of these and other events and to find booking information, see our What’s On page. 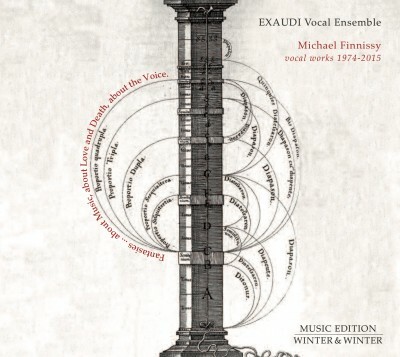 We’re thrilled to announce the release of our survey of Michael Finnissy’s jaw-dropping music for vocal ensemble on Winter & Winter. The programme shows Finnissy’s vocal writing at its most blazingly extreme: displays of virtuosity that push mind and body to the limits of their flexibility, reach, stamina and control. There are four pieces on the disc: Gesualdo: Libro Sesto (2012-13), Cipriano (1974), Tom Fool’s Wooing (1975-8/2015) and Kelir (1981), each of them a tour-de-force of virtuoso singing and overwhelming expressive intensity, and each of them a world premiere recording. To order a copy, go to our Discography page and send the relevant amount to us at manager@exaudi.org.uk via Paypal. For more information, including booking details, about all our upcoming activities, go to our What’s On page.